The idea behind Taclu, which translates from Welsh as ‘to put in order’ is to help ordinary people to work together to care for their home space and local environment. We can easily ignore or trivialise doing the most practical ‘no brainer’ activities. Picking up litter will not stop serious environmental problems but surely we have to start somewhere and our own local ‘commons’, the space we share in our village or town is the place to start. Secondly the people we share that common space with are the people we need to work with to make it better. 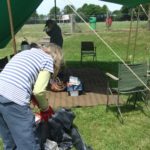 We set up the litter pickers’ shelter on a sunny saturday morning on Bishopston recreation ground. 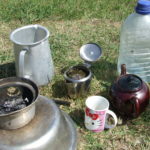 The first activity was tea making and sorting through equipment. We had no expectations, experience in organising community events tells you to be patient and welcome who ever turns up. 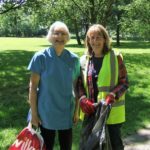 Heidi Morgan arrived enthusiastic and encouraging, we began litter picking in Copley Woods. 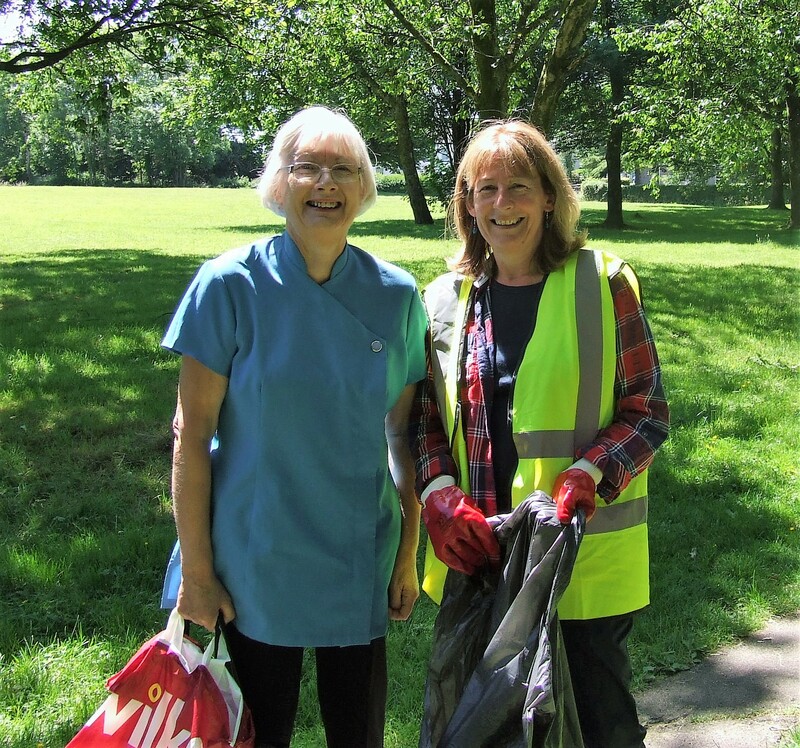 The picture shows Heidi with her neighbour; both chatted enthusiastically about their shared hedgehogs which they delight in watching as they scuffle around their gardens.We picked the litter along Manselfield road which had a lot of old rubbish covered by mulch under the hedges. Some areas need more than surface litter collecting, they need a ‘deep clean’. Back at camp we all had a cup of tea and chat about plans for future picks and the community willow growing project which Climate and Community are looking at facilitating in Bishopston. It was fascinating to find out about Heidi’s family history, a talented grand father who made beautiful willow baskets in the village. 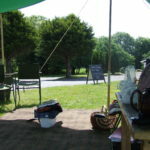 We returned on Sunday, that is the advantage of the shelter we use, (pictured) very easy to erect and take down. The design is based on a militiary dining shelter. Susie arrived in the morning and I suggested walking through the off road pathways in Bishopston village. Susie as a local knows them better than I do so she guided me along. I wouldn’t say there was alot of surface litter but the more you looked, the more you found underhedges, walls etc. We sorted out the recylable materials when we got back. In the afternoon Theresa arrived and we worked on Northway and further along towards where there are wooded banks on the roadside. In those banks there was a surprising amount of litter. Then we turned back because Theresa needed to return for the rugby. 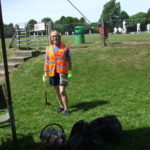 We ended the day by litter picking the carpark and green after the cricketers had gone home. 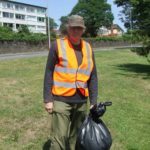 The following day we had a been asked to help pick up litter for the JCP Swansea Half Marathon by Keep Wales Tidy. Phil Budd the Swansea regional organiser had two groups, we picked from West Cross to Black Pill. 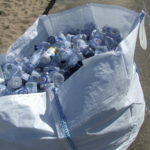 The discarded water bottles and gel tubes accumulated along the route. You wonder what people did before plastic water bottles. 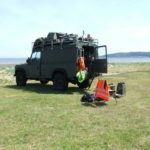 After arriving at Black pill we moved the land rover onto the front and took the opportunity to litter pick the beach. It is always surprising how much you pick up, again a selection of recent surface litter but also stuff which had been there a long time . You could tell by the state of decay the litter had undergone. It is tiring work and we made more tea and ate Welsh cakes. In the future we hope to cook our own Welsh cakes and oatcakes at the hub on a griddle. Watch this space.